A full-color manual derived from Goodman & Gilman's The Pharmacological Basis of Therapeutics. A Doody's Core Title for 2015. Goodman & Gilman's The Manual of Pharmacology and Therapeutics offers concise, authoritative coverage of class-specific and disease-specific drugs, organized primarily by organ/system. Derived from Goodman & Gilman's Pharmacological Basis of Therapeutics, Twelfth Edition and further updated, this streamlined text focuses on the principles of medical pharmacology and drug therapy and delivers coverage of all major drug classes. More than a pocket drug guide, this powerful resource covers: General Principles; Neuropharmacology; Modulation of Cardiovascular, Pulmonary, and Renal Function; Inflammation, Immunomodulation, and Hematopoiesis; Hormones and Hormone Antagonists; Drugs Affecting Gastrointestinal Function; Chemotherapy of Microbial Diseases; Chemotherapy of Neoplastic Diseases; Special Systems Pharmacology, including Environmental Toxicology. The text explains the physiology and pathophysiology of major organ systems and pathogens with respect to pharmacotherapy and the mechanisms of drug action. 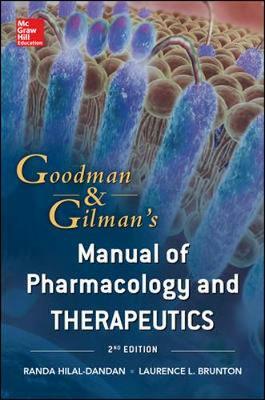 With a new full color design and numerous tables, charts, and illustrations that highlight, explain, and summarize important information, Goodman & Gilman's Manual of Pharmacology and Therapeutics is essential wherever knowledge of drug actions and interactions is required. Nursing, pharmacy, and medical students will find the Manual to be a concise and authoritative textbook.